The entrepreneurial experience of Surveyor Mario Pulicati began in 1985 with S.C.R. Srl for which he supervised the partial restructure of the Quisisana Clinic in Rome. The following year, he began to work for S.P.E.I. Srl as a purchase manager and was in charge of the technical area overseeing numerous restructuring plans such as the compliance with safety regulations of 28 movie theatres across Rome, or the restructuring of buildings of historical or public interest. In the field of civil and industrial building he supervised, on behalf of S.P.E.I. Srl, the extension of the Squibb SpA plant (nowadays Bristol-Meyer) in Anagni (Frosinone) with reinforced concrete works and construction, road and sewer works. Here is a detailed list of these and other projects (and the relative photo gallery). By the end of the Eighties, in a fit of enthusiasm caused by the imminent opening of the frontiers of the European Community, S.P.E.I. Srl started to look at the Spanish market. An Italian-Spanish enterprise in thus created in Barcelona and named CDC S.A. The first project undertaken in Spain was the urbanization (sewer system, lighting system and road infrastructures) of Can Nadal. As a result of the continuous development of this new market and the crisis that hit the Italian market (those were the years of “Tangentopoli”), S.P.E.I. Srl decided to operate exclusively in Spain and abandoned the Italian market. It was then that Mario Pulicati, preferring to stay in Italy, resigned and, together with his father Nando, founded EDILNOVA Sas in March of 1990. The new company partially absorbed the staff, the subcontracting businesses and the suppliers of the previous enterprise. At the beginning of 1997, with the strength of the increased activity, EDILNOVA Sas was trasformed into AEDES NOVA Srl. This enterprise is therefore founded on the personal experience of its two owners, especially Nando Pulicati, who already ran his own business between the Sixties and Seventies, his business being founded on the previous family activity, the building company Geom. 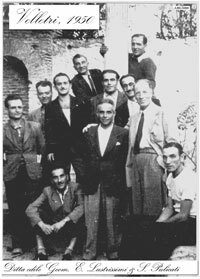 Elvino Lustrissimi & Spartaco Pulicati, founded in the Fifties in Velletri - Rome.